I phoned my son to report. “I just killed a giant spider in the family room. I hit it with a shovel!” “It’s about time”, he replied. Ah, Fall, the season when insects which have been annoying us outdoors try to make their way into the house to den up before the cold comes. Normally I try to get along with Nature’s creatures. “Everything has its place”, I repeat piously, rescuing moths, taking mice outside, not sitting on the balcony as long as swallows are nesting above. But, when a woman sees a spider the size of a dinner plate, (oh, alright then, a tea-cup), scuttling across her floor, it’s Survivor time. I’d have hit it with a broom except that the broom was up on the next floor. A big spider can cover a lot of ground. Fast. Best just to grab the shovel from the utility room. Spiders are getting sneakier, too. A recent trick is hiding among the letters in the mail box, then leaping to the floor once in the kitchen. Takes a keen eye and quick hand with the broom to keep ahead of them. It’s not just spiders looking for a winter bivouac. No, spiders join slugs and wasps as the resident plagues, in this, The Year Of The Insect. The slugs are winning their fight. I don’t use salt on food. Nevertheless, I’m constantly re-loading the salt shaker as I prowl the yard relentlessly salting visible slugs. Trouble is, like an ice-berg, what’s visible is only one-third of the problem. Slug replacements for each one deceased ooze in immediately. Talk about back-up! At this rate my yard will soon be a saline-encrusted desert over which slugs hold sway. Wasps have been the worst of all. 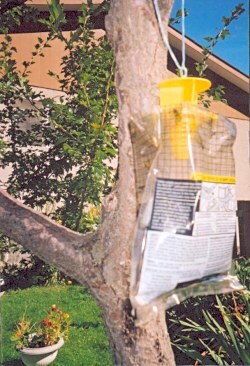 In fact they’ve been such prevalent pests that wasp traps in the entire city were sold out and desperate people were on wait-lists for traps that might or might not arrive from suppliers. I tried to co-exist, reasoning that, as long as I avoided their territory, -most of the front and back yards- and refrained from antagonizing them by watering the yard, cutting the grass or changing water in the bird bath, we could live in harmony. Unfortunately, the wasps never signed the non-aggression pact. I’d returned from a weekend camping and hiking in grizzly country. Bear beds and trails, rotten logs clawed apart, were all around our tent site. Fresh bear tracks ahead of us in the damp mud of the trail up the mountain. And? Not a threatening move, not even a low growl from any bear. The only wild-life that did damage was a wasp which made a totally unprovoked attack on me as I unloaded groceries from my own car in my own driveway. It hurt for days. This was war! I bought a pheromone trap from the agricultural supply store. “I’ll just take this $5.99 bottle trap”, I told the clerk. “No, you won’t”, she insisted. “You need the pheromone trap and this is the last one I have.” I wondered if she was just trying to unload the last $l5.99 unproven trap. How wrong I was! That pheromone trap worked on the wasps like Saturday night at the singles’ bar. For three weeks they crowded in hopefully, ignoring the fate of their deceased comrades already inside. Success in the back yard. I tried a homemade sugar-water trap for the front. No go. Wasps flew in, gulped up the goodies and zipped out to tell others about the bonanza. 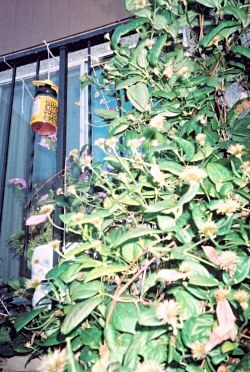 A regular, store-bought bottle trap was equally ineffective. Then someone told me to add dish soap to the water. Coats the wasps wings so they can’t fly out again. Eureka! Not everyone agrees with my vendetta against wasps. My sister, a woman not usually noted for her patience with wild nuisances, was appalled. “They do a lot of good”, she maintained. “They attack aphids and other harmful bugs.” If she’d assured me they attacked slugs I’d have been more sympathetic. Accepting that I intended to trap them, she tried to mitigate their sentence. “Can’t you just find them another home?” Not a good idea. The only activity more dangerous than trying to persuade trapped, furious wasps that I was a friendly real-estate agent moving them to an up-scale location, would be lamely explaining to their new neighbours why I’d brought a jar of testy, stinging insects to set up housekeeping near them. People here are tolerant and friendly. I’d like to keep it that way. After weeks of persuasion she made her move. Garbed in rubber boots and her ‘bee suit’, (she’s a retired bee-keeper), armed with a flashlight covered with red paper, the better to see in the dark, and a large can of Raid, she approached the nest and sprayed the stuffing out of it. Next day a few were feebly moving so she sprayed it again before removing it. No such compunction restrained another friend, who, vacationing in Costa Rica, noticed, showering with her, the largest, ugliest bug she’d ever seen. A quick-thinking woman who values her privacy, she seized a sandal and beat it into oblivion. Her bed and breakfast hostess was horrified. “That’s an endangered species!” “Well, now there’s one less of them!” retorted an unrepentant Lisa. I’m not quite that nonchalant about other creatures. But… the agri-store tells me more wasp traps have arrived. Time to stock up for next year.